We have some fantastic captive bred Russian tortoise for sale. 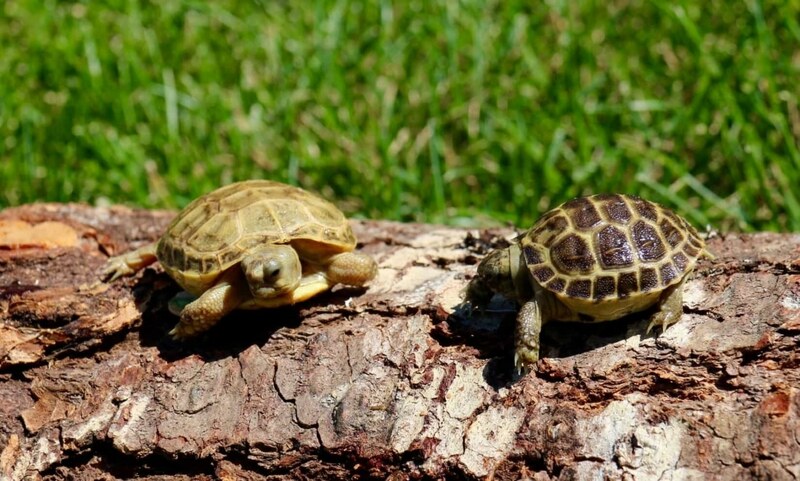 We have captive bred baby russian tortoise hatchings, 6 month old well started baby russian tortoises for sale (recommended over the more fragile hatchlings) and cute and plump 1 year old russian tortoise for sale in stock. 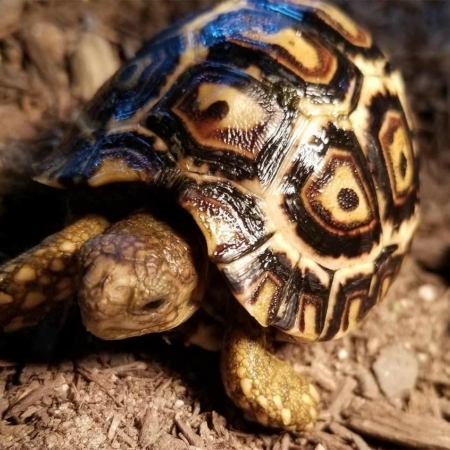 Our captive bred Russian tortoises for sale come from European breed stock and exemplify the species standard in both color, and temperament. Russian tortoises are members of the Testudo family, like Hermanns’, Greeks, Egyptians, Marginated and some other popular European species. They reach sizes of 6-9″ on average with most falling in the 6-8″ range. Russian tortoises are mediocre in terms of care level, and make great additions to any tortoise collection. 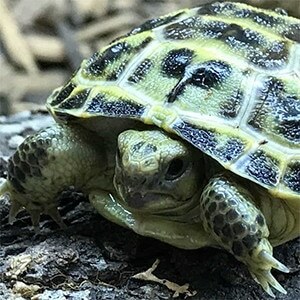 With a Biologist ON SITE, all of our Russian tortoises for sale online come with our live arrival and full 7 day health guarantee. If you purchase a complete tortoise setup kit from our shop, your tortoise will automatically come with a 30 day health guarantee. Our Russian tortoises for sale are ready to ship to your door via UPS or FedEx in heated or cooled containers and will arrive the morning after shipment. Typically they leave here around 7pm and are on your doorstep the next morning between 8-10am. We have some beautiful captive bred russian tortoises for sale. 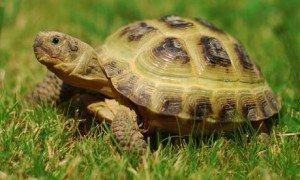 The russian tortoise for sale is probably the most common small tortoise for sale in the world. 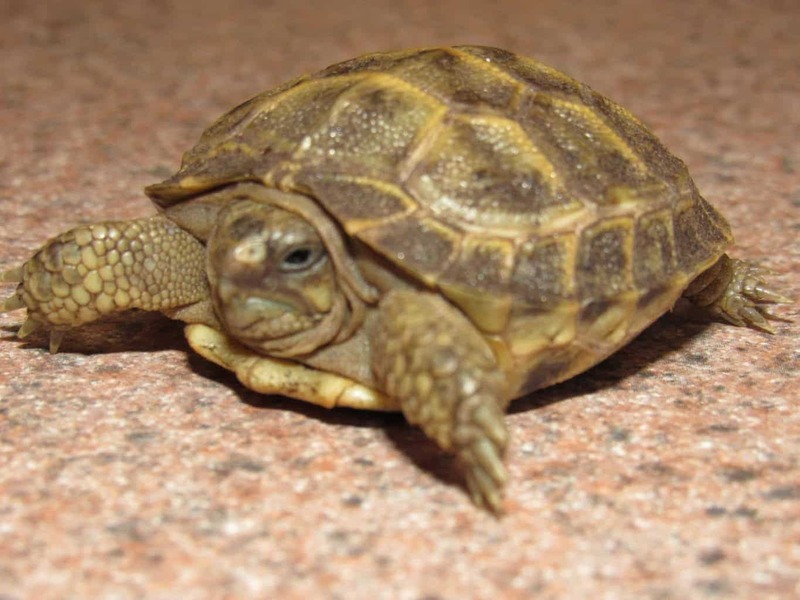 The russian tortoise for sale online are usually WILD CAUGHT adults and NOT Recommended for purchase. 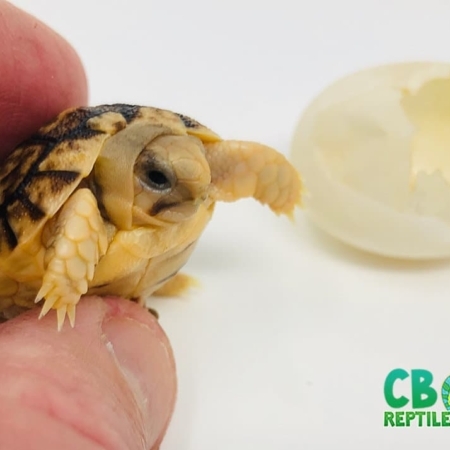 Please rest assured that CBReptile.com sells only 100% captive bred baby russian tortoises for sale online. The russian tortoises sold at pet stores are almost ALWAYS wild caught, and are normally over 20-30 years of age and do not make good additions to your reptile family. Most adult, wild caught, cheaply priced Russian tortoises are imported into the United States. 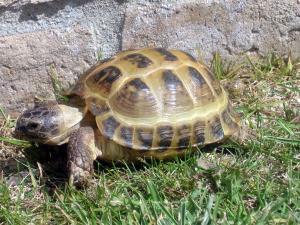 There are also captive bred babies available from Russian tortoise breeders, like us. Compared to the number of imported tortoises, captive production of this species is relatively low. You should assume that most adult or subadult Russian tortoises for sale are wild-caught (imported). 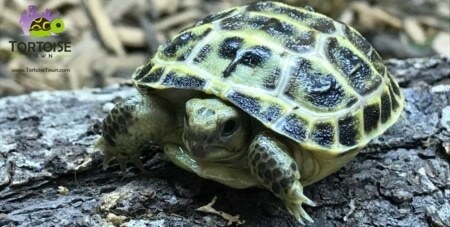 Captive-bred babies are rarely raised to adult size and sold at the low prices that these imported Russian tortoises sell for. A popular pet tortoise, Russian tortoises are one of the most readily available tortoise species. They are small, making them easy for most people with limited space to keep. They are also feisty, eager to eat and more active than some other tortoises. When allowed to burrow, Russian tortoises also have one of the highest tolerances for temperature extremes. They are one of the few species that can be kept outdoors in most of the United States, year round. 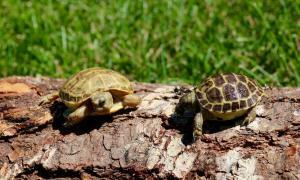 These factors make Russian tortoises attractive for new tortoise keepers and a fun tortoise for seasoned veterans. 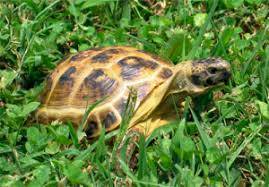 Only buy captive bred baby Russian tortoises for sale, as wild caught adults do not make good pet tortoisesfor sale! It is a very round tortoise when viewed from above, certainly compared to most tortoise species, generally with a flattened top to the shell rather than being high-domed. Its color is usually a mixture of tans and browns, occasionally with a green cast. The plastron is mostly black, and the skin color, including the entire head, is usually tan, dark gray or brown. Adult male Russian tortoises usually attain 5 to 6 inches in length, with females reaching 6 to 9 inches. Within our breeding colonies, most males are right around 5½ inches and most females range from 6 to 7 inches. Our largest Russian tortoise is a female about 8 inches long. It’s not unheard of for them to reach 9-10 inches, but this is not common at all. 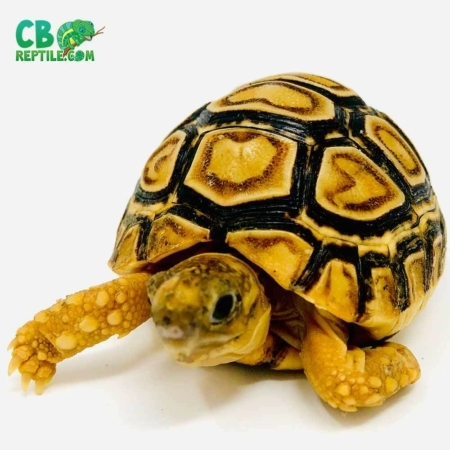 Like all tortoises for sale at CB Reptile, our Russian tortoise for sale are all 100% captive bred baby tortoises for sale and come with our live arrival and FULL 7-day health guarantee. With a biologist on-site, our Russian tortoises for sale as well as all of our reptiles for sale online are the best available in the USA! 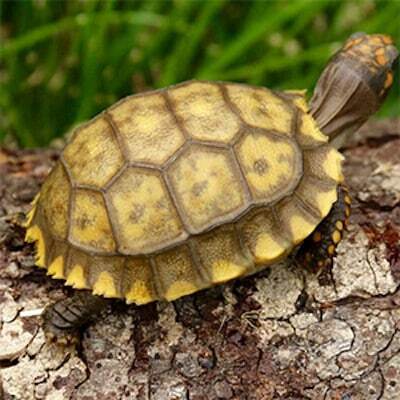 Cb Reptile is proud to offer OVER 25 species of healthy, captive-bred baby tortoise for sale ! CB has much more than just pancake tortoises for sale! We breed over 22 species of small tortoise for sale including, Hermann tortoise for sale, Indian star tortoise, Sri Lankan tortoises, Golden Greek tortoise for sale. My red foot tortoises purchased from cbreptile.com are doing great. They came the next day and are really friendly. I would recommend cbreptile to anyone looking to buy a red foot tortoise for sale. I bought a male female pair of blue ambanja panther chameleons for sale last Christmas and they are both doing well. The male is much more outgoing then the female but they are both gorgeous! The male loves to hand feed, where as his lady is much more shy. I would definitely purchase another panther chameleon from Cbreptile in a heartbeat. I am very happy with the russian tortoise I received from CBReptile.com . The shipping was fast and the tortoise is awesome! He is very outgoing and loves to follow us around the house already when out of his habitat. I would purchase from this company again without blinking an eye.